Helping you efficiently manage your 3650 MHz spectrum while protecting incumbent users in the band. 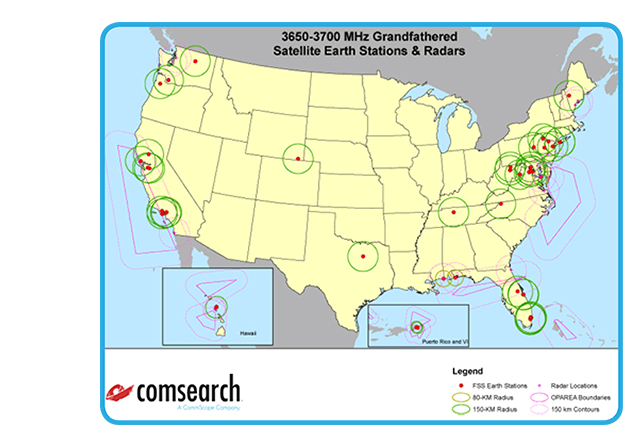 The FCC allocated 50 MHz of spectrum in the 3650–3700 MHz range for terrestrial wireless broadband service regulated under FCC Part 90 rules. Licensees in this band may provide a broad range of new products and services, including high-speed, wireless local area networks and broadband internet access. As of April 17, 2015, the FCC will not issue any new Wireless Broadband Service licenses or license renewals in the 3650-3700 MHz band [see 47CFR90.1307(b)]. New WBS site registrations under existing licenses will not be entitled to interference protection from Citizen’s Broadband Radio Service users [see 47CFR90.13387(a)].